This blog may be lacking in details. I forgot iPad at CFS, thus I’m working from my very poor memory. I may add details tomorrow. Today was a very busy day, as I coached the 6, 8:30, 11:45, 4, 5:15, & 6:30 WODs and Accelerated Foundations, Part from 1 to 3. Jeff’s out of town at an HR meeting, so I was left to my own devices. I completed the press series before coaching the 8:30 WOD. I began at 65#, more than 50% of 1RM of 125. I completed 3 reps every 30 seconds. The last 2 sets were completed at 100#, 80% of 1RM. Presses of all varieties felt great. I once again incorporated what I’ve learned from GF. I can’t wait to attempt new 1RM for all presses! I dreamt of Walter White and Jesse Pinkman all of last night. Why is it that Meg and Zac insist upon sleeping on me instead of beside me? As Felicia and Jaclyn were the only 2 to attend the 8:30 session, I joined them for the strength component. I completed lifts at 165, 185, & 200#. I felt particularly strong today. I took Luke for a long walk, had a quick bit to eat, and returned to the box to complete tomorrow’s programmed metcon. It’s a doozy. Ok, so this is how it works. Place a slam ball by the internal wall and a wall ball beside the external wall. Begin from either side (I chose internal wall) and run 1 shuttle run. Complete 1 wall ball (as that’s where shuttle run ends). Run 2 shuttle sprints and complete 2 wall balls, run 3 shuttle sprints and complete 3 slam balls, 4 shuttle sprints and 4 slam balls, etc. Repeat, but begin at other side of box, i.e., external wall. I completed both rounds in 5 and change. Nope, I can’t remember the exact time. This was a very taxing metcon, and I was quite winded by the finish. 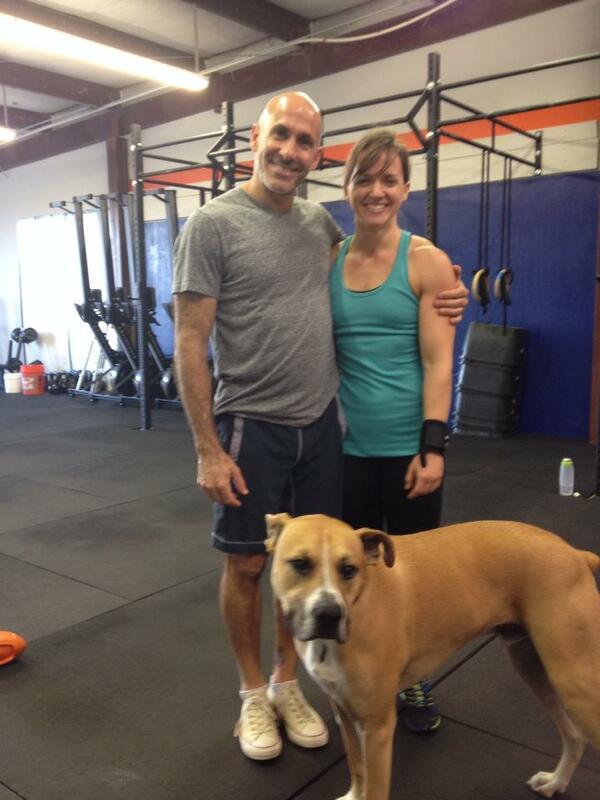 My friend Jen attended the 5:15 WOD! It was wonderful seeing you, Jen! Please visit — and guest coach!